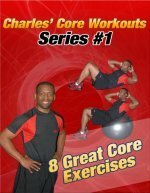 You can do piques with a stability ball or with workout discs. They are both among the best core exercises for men and women. If you've been working your core muscles with a stability ball, chances are you've tried (or at least seen) the pique exercise with a stability ball. Well, if you'd like to try another variation, you can use gliding workout discs to get a different feel from the same exercise. New tools get introduced to fitness all the time, and it's nice to have some variety if you're getting bored with the exercises that you're currently doing. 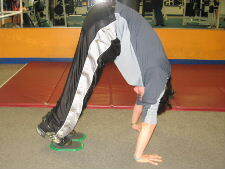 Below are pictures of the pique exercise with gliding discs. Form: Keep your knees straight, and use your core muscles to lift your hips up towards the ceiling while sliding the discs forwards towards your hands. Hold for a brief moment and then slowly return to the starting position. Personal Trainer Tips: This exercise requires good upper body strength and good flexibility. Only move as far as your body feels comfortable. If you feel flexibility is an issue, then try stretching your hamstring muscles and lower back muscles. 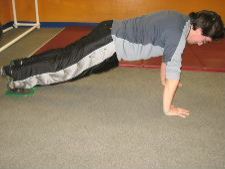 If you feel upper body strength is limiting you during this exercise, try building up your arm strength with push ups. Also, if the pique exercise is too challenging, you can build up your strength by doing knee-ins with the workout discs. If you've seen workout discs lying around your gym, try a few core strengthening exercises with them. They offer a slightly different feel when compared to other tools like stability balls, and some people like the disc more than the ball. Try, them both and pick your favorite exercises.